Happy Friday, everyone! 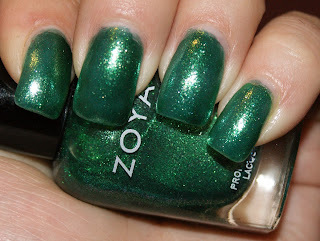 I thought we were a long time overdue for a little Zoya love! This is actually my most recent Zoya purchase, the lovely green foil polish that is Ivanka. This is Ivanka with two coats. Like the rest of the Flash and Sparkle collection, including Charla and Mimi, you really need three coats. Ahh! Three coats of emerald, sparkly goodness! It is just GORGEOUS! So what do you think of Ivanka? Oooh shiny! Do you know how it compares to CG Emerald Sparkle or Glittering Garland?